Time for another Tuesday Stretch with the BugDoc. Tonight I would like to discuss some stretch glass pieces that I have difficulty assigning to any makers! 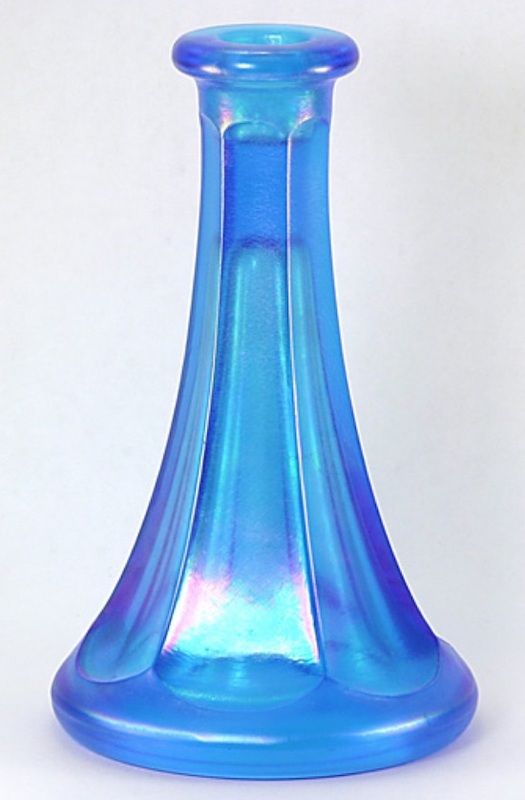 Most of the pieces that we know have been identified using two methods – original catalog pages and trade journal discussions or using unique colors (like U.S. Glass’ opaque colors or Fenton’s Tangerine). When we assembled all the green stretch at our convention, it was obvious that there seemed to be some general trends in the Florentine Green-style colors made by Central and Diamond compared to Fenton’s, but even then there were variants that just didn’t fit. My first one is a little 6-inch candleholder that Phil and Nancy Waln brought to our convention a few years ago. I’ve seen nothing like it and still haven’t! It kind of has a look of a Northwood piece, but this is simply a guess. It is well done, has nice color and iridescence! 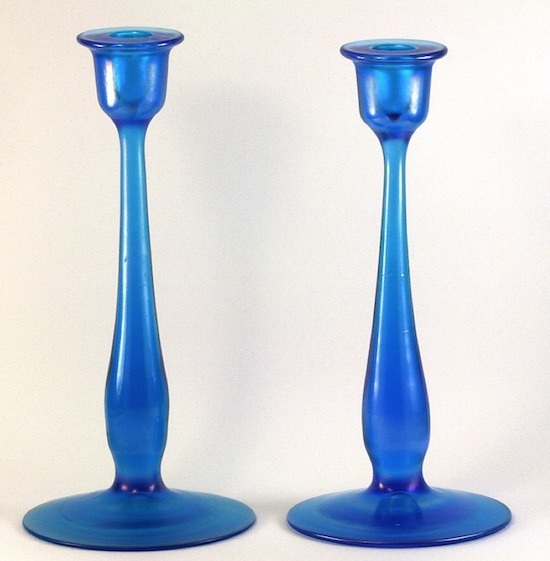 Here is another set of candleholders in the 8-9 inch range, also in blue. 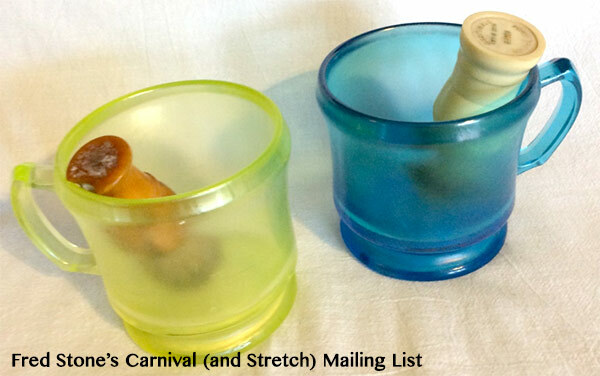 They look a lot like some of the U.S. Glass holders, but those have a little ring where the stem meets the foot. These have no hint of a ring! These were also swung and they ended up with different lengths. 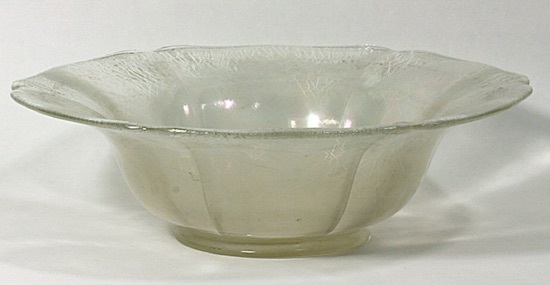 The crystal stretch bowl (about 8-inches in diameter) below has all the hallmarks of U.S. Glass, but the rays and points are different than anything else they produced. I picked up this set of toothpick holders many years ago on eBay when nobody was looking! LOL! When I received them, I figured that someone had found some old toothpick mold and was reproducing them. But, no more were posted. However, this last July, Burns showed up with a topaz one for sale at the stretch glass auction! Most now think that these are a U.S. Glass production. Next is another 8-inch diameter blue bowl with external panels. It is really nicely done, but I have no idea who made it. It is a darker blue, like some of the Northwood “sapphire blue” pieces. A few years ago, Jim and Pam Steinbach showed up at convention with the blue bowl (about 9 inches in diameter) below. 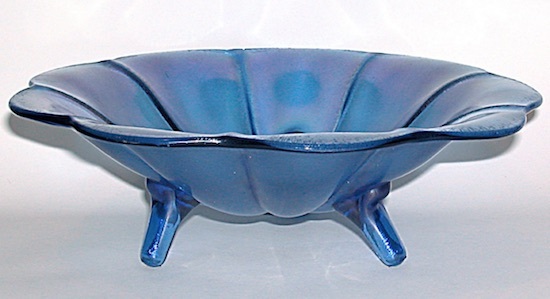 It is a really elegant, three-footed bowl but the blue has kind of a purple look to it. Because of the strange color, I’m leaning toward Vineland, but the feet are similar to some U.S. Glass pieces. Too bad there aren’t more of these around! 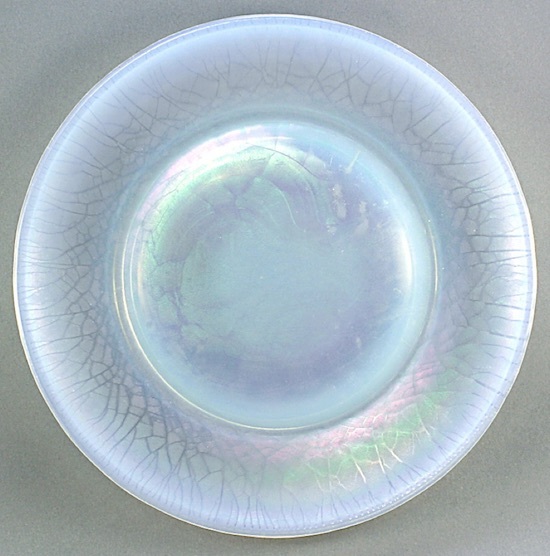 Finally, here is an 8-inch plate in a translucent opal color! It has a ground marie (foot), but it doesn’t match the size of the Fenton or Northwood plates of similar manufacture. This one really has me stumped!